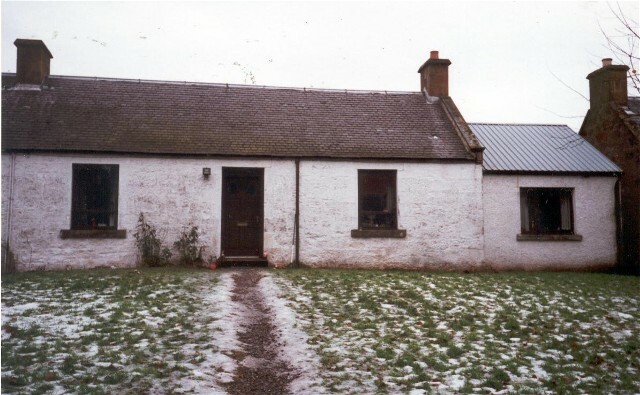 Balintraid Cottages, next to Balintraid Farm. These were mentioned in the Census 1871 - 1901. Picture taken Winter 2000 by Annella Flynn who lives in Invergordon. I have family, George Douglas and Margaret McKay and their children, who were living in Balintraid Cottage in the 1861 census. Their eldest daughter Elspet (Elsie) had already left home after she married Alexander Munro in 1859 and was living at Polo Farm in Barbaraville. My g-grandfather, George Mitchell (who later married Elsie's daughter) was living at Balintraid Farm in 1881 with his mother Christina and step father Donald Ross. Can anyone tell me anymore about the farm and the cottage? Were there many houses or cottages, etc, or just a couple on each farm? My William McKay and Isabel Munro lived in Balintraid between the 1820s and 1840s. I assume they lived in a servant cottage maybe like this. William was reported to be a servant or labourer in the OPRs. It is very interesting to see what their homes could have looked like. Hi my name is Linda we lived at Balintrad in the 1960. My dad was the cattle man we lived in the cottage next to the farm. My dads name was William Ross (deco) I loved been on the farm. Linda, I am assuming it's your Dad in picture #44 on this site?